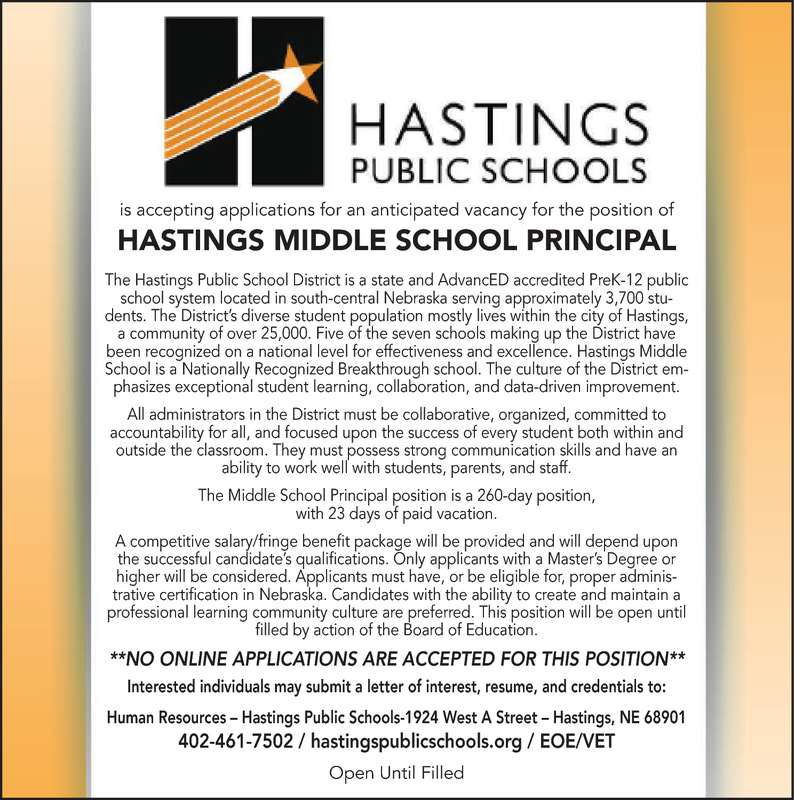 The Hastings Public School District is a state and AdvancED accredited PreK-12 public school system located in south-central Nebraska serving approximately 3,700 students. The District's diverse student population mostly lives within the city of Hastings, a community of over 25,000. Five of the seven schools making up the District have been recognized on a national level for effectiveness and excellence. Hastings Middle School is a Nationally Recognized Breakthrough school. The culture of the District emphasizes exceptional student learning, collaboration, and data-driven improvement. The Middle School Principal position is a 260-day position, with 23 days of paid vacation. A competitive salary/fringe benefit package will be provided and will depend upon the successful candidate s qualifications. Only applicants with a Master's Degree or higher will be considered. Applicants must have, or be eligible for, proper administrative certification in Nebraska. Candidates with the ability to create and maintain a professional learning community culture are preferred. This position will be open until filled by action of the Board of Education.